Brawl Stars updates: All updates and new brawlers in one place! Welcome to our Brawl Stars update hub! We’ll be collecting all of the official balance changes and updates for Brawl Stars as they’re released by Finnish giant Supercell. If you can’t get enough Brawl Stars, be sure to bookmark this page to stay up-to-date on the latest buffs, nerfs, new game modes, and new brawlers added to the game. Below you’ll find the most recent update, followed by a list of new brawlers as they’re released. Previous Brawl Stars updates can be found at the end of the page. Clash of Clans update hub: All the latest buffs, nerfs, and new troops! This Brawl Stars update brings some long overdue changes to competitive ranking system, including changes targeted specifically at teamers in Showdown. This should improve gameplay experience across all game modes. There’s also a new melee Brawler in town: Rosa! She’s similar to Primo, but with a new shield mechanic for her Super. She should give players who like to get up close and personal another great option for battle. Look for her to be released soon after the patch hits. Rosa creates a tough second skin of vines, preventing 80% of incoming damage for 6 seconds. Rosa regains health while inside bushes. Celebrate Easter with Bunny Penny. Celebrate Golden Week with Shiba Nita. Carts travel on the railroads on certain intervals. Carts block shots, deal damage and push back Brawlers when hit. Showdown: Flying Fantasies(with Launch Pads! ), Royal Runway. Siege: Junk Park, Sparring Match, Straight Shot, Assembly Attack. Meteors now target grouped players with better logic and the Meteor explosion radius is bigger. Healing mushrooms and Energy Drinks are now more likely to spawn farther from grouped players. Bolts now spawn closer to the middle. Frank’s stun only works for a split second on the IKE. IKE projectile now homes to the target (but not against flying units). Some homescreen Buttons Moved into Menu. Watch high-level gameplay live on Brawl TV. Preview and test new brawlers in the Training Cave. Added Polish and Hebrew languages. Name Change for Gems – First is free! Then 60, 90, 120, 150 Gems for each consecutive change. New Menu background and music for Golden Week event (coming soon). Slightly more difficult matchmaking for teams. Support for color tags removed (color codes can be removed with one free name change) Players have an option to pick a color from their profile screen. Improved poor connection symbol display during battle. Increased Super button’s tappable area. Spawn the second Gem in Gem Grab later. Shows Star Icon under Pets if they are affected by Star Power. In-game model rework, New Effects and Projectiles. New effects and projectiles for Little Helper Penny skin. New animation for Boombox Brock skin. New projectile for Golden Barley skin. Robo Rumble: Fixed an issue in Robo Rumble where the enraged melee robots were not hitting the safe. Brawl Ball: Fixed an issue that caused Ball to bounce from walls that were destroyed while the ball was moving after a kick. Brawl Ball: Own goal is attributed to the last player from the opposing team to touch the ball. Brawl Ball: When Penny’s Star Powered Mortar explodes after a goal it no longer shoots out cannon balls. Fixed an issue that prevented spectating while ready in a game room. Fixed double rank up token reward not being visualized correctly in the battle end screen. Fixed an issue that caused a player to be unable to reject/accept Game Room join requests. Fixed an issue that caused online time for new Club members to be shown as “< 1 month ago>”. Fixed an issue that caused Club member statuses to not update instantly. Matchmaking hints are no longer displayed for unreleased Brawlers. Season end trophy decay handling improved. Fixed a bug where you could end up having the super button stuck down if you shot your super the exact same time when you got hit by a pushback. Pet spawning will occur even if the Brawler dies while activating Super. Increased main attack damage from 280 to 300. Increased super damage from 280 to 300. Increased poison damage per second from 70 to 75. Increased boomerang speed by 25%. Increased Super duration from 2.5 sec to 3.0 sec. Stuns, pushbacks and pulls now interrupt Carl’s Super ability. Fixed a bug causing Carl to not reload when the boomerang returned. Carl no longer has a reload animation when he spawns. Carl’s Pickaxe now returns even if Carl dies when the Pickaxe is flying towards the target. Increased health from 4000 to 4200. Increased main attack range from 7.33 tiles to 7.67 tiles. Increased main attack projectile speed by 5%. Increased the number of Bombs dropped from Super from 3 to 4. Increased Super Bomb damage from 800 to 900. Bombs now spread on a little bit larger area (+10% diameter). Fixed a bug that allowed Gene to pull the Robot boss so that it got stuck in Boss Fight. Fixed a bug that caused Gene’s pull to stick enemies inside walls when pulling close to an indestructible wall. Fixed a bug that didn’t allow Gene to pull enemies with his Magic Hand while being poisoned by a lvl 10 Crow. When a pulled enemy dies during the pull the hand no longer destroys the environment. When Gene is pulling a target with his Magic Hand the target cannot be pulled by another Gene. Quickfire now takes into account the added range from the projectile splitting. Decreased main attack damage from 260 to 240. Decreased health from 4400 to 4300. When Nita and her Bear and Pam attack Pam’s Healing Stations they now receive the star power healing effect. Decreased Super Invisibility time from 8.0 sec to 7.0 sec. Increased Super healing from 1840 to 2100. 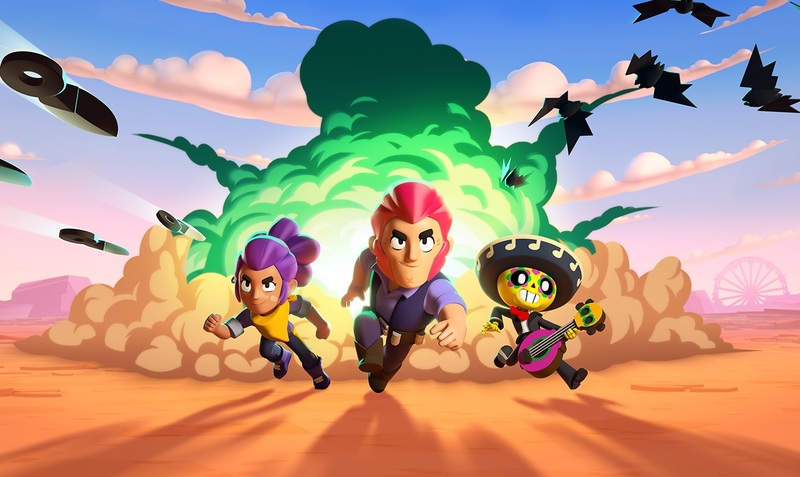 Like new troops in Clash of Clans and new cards in Clash Royale, Supercell releases new brawlers in Brawl Stars from time to time. Below you’ll find all of the new brawlers released since the game’s global release in reverse chronological order. Rosa is a melee Brawler with a real green thumb. Her Spike-y fists deal damage at close range and her super helps her survive even the strongest of assaults. Rare Brawler announced in the April update. Similar play style as Primo. Rosa releases a flurry of punches. Prevents 80% of incoming damage. Carl is a pickaxe wielding miner that drives around in a mining cart. He only has one ammo, and his super sends him flying into enemies! Super Rare Brawler announced in February update. Short range Brawler with just one ammo. Carl throws his Pickaxe, consuming his only ammo. Pickaxe bounces off obstacles, returning to Carl after bouncing. Upon returning, ammo is restored. Can hit enemies twice per shot. Carl spins around in his mine cart, damaging nearby enemies. Gene uses his magic lamp to shoot a splitting projectile. His super is a magical hand that grabs and pulls enemies close! Shoots a ball of smoke from his lamp. If it doesn’t hit, it splits and spreads in a cone. Launches a magic hand from his lamp. Pulls first enemy hit back to Gene. Leon shoots a quick salvo of blades at his target. His Super trick is a smoke bomb that makes him invisible for a little while! Legendary brawler released with December update. Main attack fires four blades that do increased damage to close targets. Super makes him invisible for a brief amount of time. Taking damage while Super is active will briefly reveal Leon. Attacking will permanently remove the invisibility. Nearby enemy brawlers will be able to see him, but turrets and pets will not. Increased movement speed when Super is active. The February Brawl Stars update brings yet another new Brawler and a brand new game mode. Carl is a unique Brawler with just one ammo slot that replenishes when his flying Pickaxe returns. It passes through enemies and comes back upon reaching max range or bouncing off of an obstacle. The new game mode, Siege, introduces a few new elements of strategy that enables a variety of Brawlers to get into the action. It features two teams of three that vie to collect Bolts in the middle of the map to send a massive Robo towards the enemy cannon. Check out the full patch notes below! New Super Rare Brawler to be released in mid-March. Throws a Pickaxe that passes through enemies. Has just once ammo, which is not consumed when kicking the ball in Brawl Ball. Super sends him spinning into enemies, dealing AoE damage. New 3v3 game mode with 3 unique maps. Each team has a powerful long-range cannon, dealing massive damage. Teams collect Bolts in the middle of the map. At certain intervals the team with the most Bolts spawns a powerful Robo to attack the enemy cannon. Gives double trophies, exp, and rewards due to longer game time. New skin to celebrate the anniversary of the Clash Royale release. Safe health increased to 40000 (up from 36000). Enraged robots will target the safe only. Healing Mushrooms heal for less later in the game. Item pickup range increased to 1.33 tiles (from 1 tile). 4 new Showdown maps added. 7 new Gem Grab maps added. 1 new Brawl Ball map added. New map element – Launch Pads – added. Showdown now only appears in event slot 2. Siege added to event slot 4. New Clash Royale Birthday music added. Brawlers now sortable in selection screen. Do not disturb mode added to mute invites during a session. Fixed a bug hiding teammate respawn timers. Fixed in-game hud element bugs. Fixed a bug causing boss to get stuck in Boss Fight. Fixed a bug where bots in a friendly game didn’t have max power level. Main attack damage increased to 680 (up from 640). Super damage increased to 680 (up from 640). Main attack damage increased to 500 (up from 480). Star power healing increased to 200 per second (up from 100). Super projectile size increased to 200 (up from 150). Super now deals no damage. Super now travels through walls. Super now charges 30% faster. Star power healing no longer shown to enemies. Main attack reload time decreased to 1.4 seconds (down from 1.5). Main attack damage in close range decreased to 440 (down from 460). Number of shuriken hits to charge super in close range increased to 9 (up from 8). Star power healing reduced to 1400 (down from 1800). Main attack reload time increased to 1.3 seconds (up from 1.2). Super autocharge time increased to 30 seconds (up from 20). The first major Brawl Stars update since the global release is here! It mostly contains tweaks to brawler balance and a few notable nerfs. The newest brawler Leon is finally being taken down a peg, with nerfs to both his Super duration and close range damage. The biggest changes are to the maps themselves. Green bushes no longer respawn on any maps, which will have a major impact on close range brawlers. There are a few smaller adjustments to other game modes, like Bounty game duration, Brawl Ball spawn location, and Showdown poison damage. On top of all of this, there are several new skins to celebrate the Lunar New Year, as well as a new Brawler coming soon. Best of all though, there are economy changes that increase player token limits to 200 and lower the gem cost of Star Powers. Gene is a ranged support Brawler. Gene’s Super pulls an enemy to his location with a magical hand from his lamp. Gene will be released some time mid-February. Pink Spike skin replaced with Sakura Spike. Green bushes no longer regrow after 35 seconds. Exploded environment elements no longer leave one-tile gaps. Spawn location moved inside the goal. Kicking the ball now consumes ammo. Kicking the ball with Super does not consume ammo. Space behind the goal removed on all maps. Player names now empty over 300 trophies instead of displaying “???”. Poison no longer deals damage instantly upon spawning or growing. Game length reduced to 2 minutes (from 2.5 minutes). Now shows when the next Boss rage stage begins. One additional rage stage added. Now displays difficulty setting while in-game. Player respawn time increased by 2 seconds. Safe health increased to 36000 (from 30000). Star Power healing increased to 500 (from 300). Star Power damage per second increased to 300 (from 240). Star Power visibility range increased to six tiles (from four tiles). Main attack damage increased to 480 (from 420). Star Power damage increased to 800 (from 600). Star Power healing increased to 300 (from 200). Main attack damage per second increased to 640 (from 600). Super damage per second increased to 640 (from 480). Super bottles now spread across larger area when cast at short range. Damage from multiple Super bottles no longer stacks. Star Power healing increased to 500 (from 400). Star Power shield increased to 40% (from 30%). Main attack damage per shell increased to 280 (from 260). Star Power pet (Tara’s Shadow) damage increased to 400 (from 200). Star Power pet (Tara’s Shadow) health increased to 2400 (from 2000). Super invisibility time decreased to eight seconds (from 10 seconds). Main attack damage at close range reduced to 460 (from 500). Main attack damage increased to 900 (from 800). Super damage increased to 900 (from 800). Star Power no longer leaves behind a green skull. Star Power now increases his damage by 40% upon kill. Star Power no longer leaves behind a purple skull. Main attack damage increased to 300 (from 280). New visual effects for Brawlers and skins. Mortis now has a VO. Bo now has a VO. Brock now has a VO. Game room chat is now visible after other players have left. Leaderboard location now changable in settings. Star Power gem price reduced to 233 (from 266). Player token limits increased to 200 (from 100). Bounty and Heist now share event slot 3. Four new Bounty maps added. Three old Bounty maps retained. Four new Heist maps added. Three old Heist maps retained. Retained Heist maps reworked to promote Brawler variety. Brawl Ball and Modifier Showdown now share event slot 4. One new Showdown map added. One old Showdown map removed. One new Brawl Ball map added. Modifiers now only apply to Showdown event modes. Life Leech event modifier removed. Gem Grab, Bounty, and Heist maps removed from event slot 4 rotation. The December update is hitting just before global launch, and it features a number of big changes, including all new 3D maps and a brand new brawlers! The hoodie wearing assassin Leon is a new legendary brawler that does big damage and can go invisible with his super. In addition to the change to 3D graphics, the user interface also received a number of updates. Bands have been renamed to Clubs, more languages are now supported, and the fourth game type (modifier mode) is now a permanent feature. Leon is an assassin that can go invisible with his Super. Super damage increased to 300 (from 280). Super charges from eight dagger hits (down from nine). Health increased to 5200 (from 5000). Health increased to 4400 (from 4200). Reload time reduced to 1.8 seconds (from 2.0 seconds). Super cannon balls no longer shoot randomly. Main attack projectile speed reduced by 6%. Super charges from 13 hits (up from 12). Main attack spikes are less random. Main attack range decreased to 4.33 tiles (down from five). Super range decreased to seven tiles (down from 23.3). Super charges in 11 hits (down from 13). Super charges automatically over 20 seconds. Star Power now activates a shield reducing damage by 30% for 3.5 seconds when using Super. Main attack damage reduced to 260 (down from 360). Super attack damage reduced to 400 (down from 640). Health reduced to 4,000 (down from 5,000). 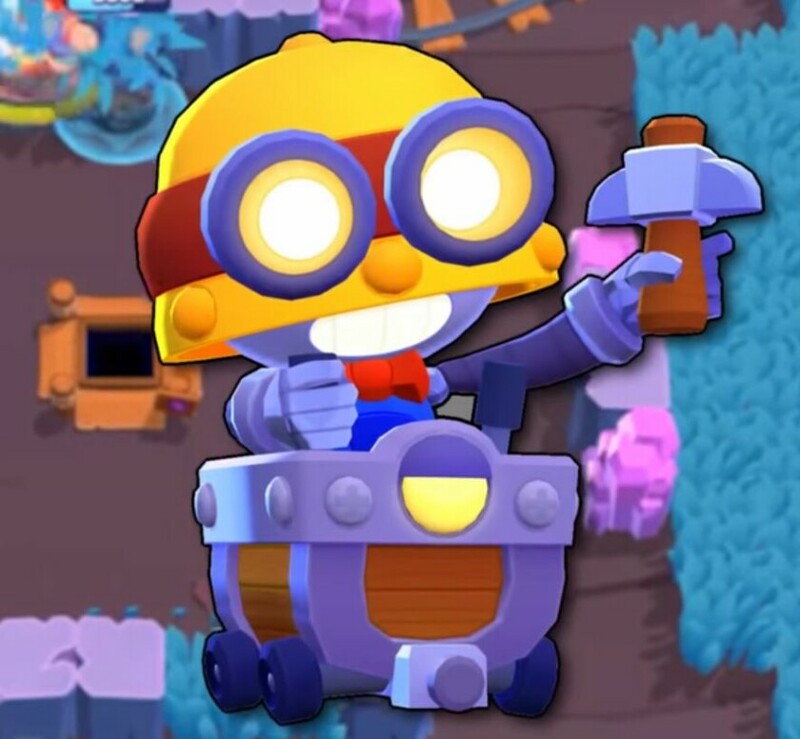 New Models for Shelly, Bull, Nita, Barley, Dynamike, and Brock. Bandita Shelly, Viking Bull, Panda Nita, Golden Barley, Beach Brock skins have been updated. Star Shelly skin available for free to anyone who plays Brawl Stars before 2019. Wizard Barley skin available for free to anyone who connects a Supercell ID account. Unlocking the Wizard Barley skin also unlocks Barley for players who don’t have him. All maps are now 3D environments. Loading screen and user interface have been updated. New Modifier Mode – Healing mushrooms. Healing Mushrooms heal players inside their radius. Robo Rumble map now larger and enemies attack from all sides. High level melee bots no longer charge. Player-based healing (Barley’s Star Power, Pam’s Star Power) reduced by 75%. Dying from life leech poison now gives full health to the player who caused the poison. Robo can no longer see into bushes. Robo can no longer hide in bushes. Robo now drops five power cubes on death. Pets and turrets can now target Robo. Brawlers can now charge their Super by shooting Robo. Game Rooms are now called Teams. Anyone in the Team can invite players from their friends list. Players can now send a request to join a team. Gem Grab, Bounty, Heist and Brawl Ball maps are now four tiles wider. Players now spawn behind the goal in Brawl Ball. Players now spawn behind the safe in Heist mode. All brawlers can now cancel attacks to activate their Super. Brawl Ball aiming direction visible to teammates. Haptic feedback added for when cancelling aiming. Penny, Pam, and Poco have new voices. New permanent game mode slot added for Ticketed modes. Modifier game modes are now always available. Free daily item rotation now includes Free Coins, Power Points, Key Doubler and Tickets. That’s all for our Brawl Stars update hub! Be sure to bookmark this article, as we’ll update it over the next few weeks and months with the latest releases! Happy brawling!